The American traditional ceiling fan company Hunter can look back upon an exciting history. In 1886, the father and son John and James Hunter presented their first ceiling fan to the world. Since that day, the company has successful developed and produced a variety of designs of ceiling fans, right up to the present day. But one thing has remained - the most traditional and high-quality model, the Hunter Original. Unchanged since the 1930s and still just as successful. The major special feature of the Hunter Original is its self-cooling, cast iron motor which is stored in a permanent oil bath, is dynamically balanced and runs very quietly in spite of its bulk. The initial supply of oil is included. Subsequent refills can be purchased as accessories. The five included real wood reversible blades can be installed on either side. This means that you can switch between elegant cherry wood and walnut at any time. Installation with just four blades is also possible. The ceiling fan Hunter Original can be operated in a cooling summer mode with forward rotation or in a heat-circulating winter mode with reverse rotation. A sliding switch can be used to set the rotational direction. It is controlled by means of a pull chain. It can optionally be retrofitted with a remote control or a wall switch. Suitable models can be purchased as accessories. 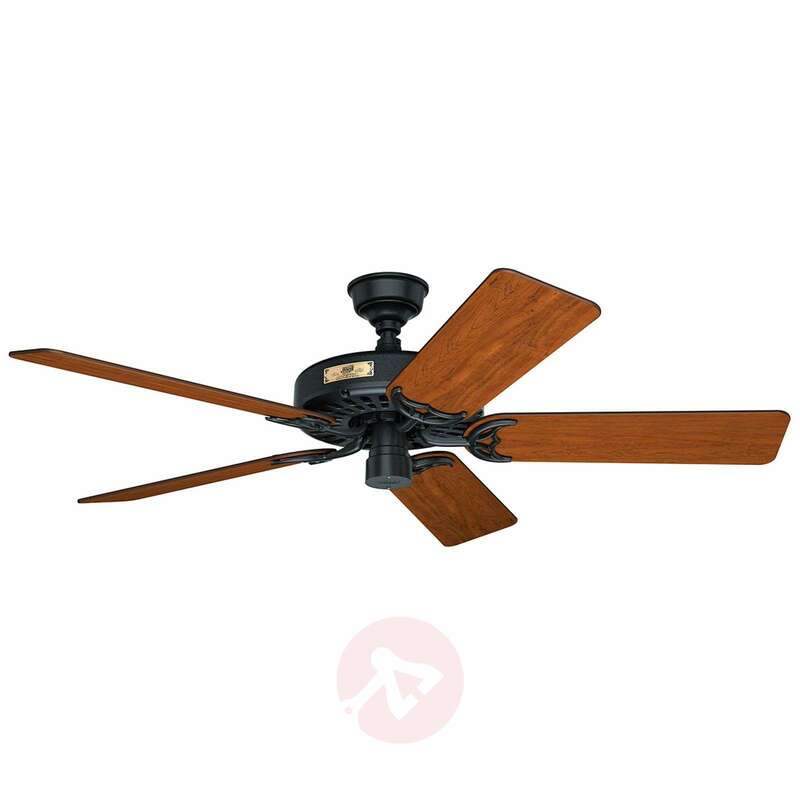 The Hunter Original ceiling fan is also suitable for sheltered outdoor areas as it is moisture-resistant. Due to its solid construction, the Hunter Original ceiling fan has a weight of just under 20 kg.